For the past few months I've been feeling like there isn't much time for crafting. Sure, I've been able to do a short craft here or there for the blog but nothing to substantial. 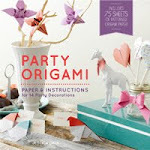 Over the weekend I finally got a chance to sit down and work on some projects I had bookmarked. 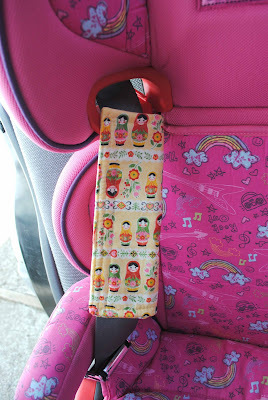 It felt really good to just sew and make this seat-belt cover. I think I was going through a crafting withdrawal or something because when I finished this, it was like crafting euphoria. I was so pleased with it that I wanted to sew some more, and more, and more! very cute! 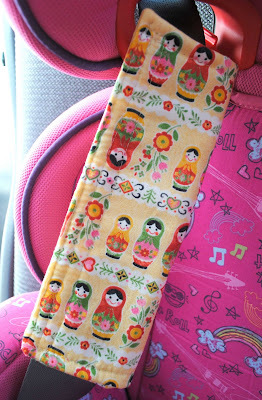 I love the Russian Doll fabric. 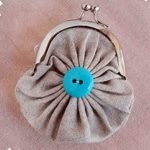 I used cotton fabric that I got from www.modes4u.com. that fabric is super cute! Love it! And love that fabric! I completely understand your feeling of craft euphoria. 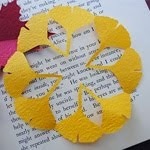 I've not only been AWOL from blogging, I haven't had time to actually craft! Last night I made myself a ham for ironing sleeves because I've been needing one, and I was so excited when I was done that I ironed four buttondowns immediately. See what craft euphoria can do sometimes? In any case, even little things bring pleasure, and I think your seatbelt cover is just adorable. I love that fabric. i like the pattern and if you can do that, why buy? right? My sister has that same car seat for her kid! I'll show her the seat belt cover, she'll love it!